K100-forum.com » General discussion » Australian and New Zealand rides and meetings » A Return to Nindigully. Now that Kerry and I are back in our beloved high country, I'm thinking of a return ride to Nindigully and Ashford, as some of us did a couple of years ago. Tentative plan would be to go on either the weekend of May 12th or May 26th. 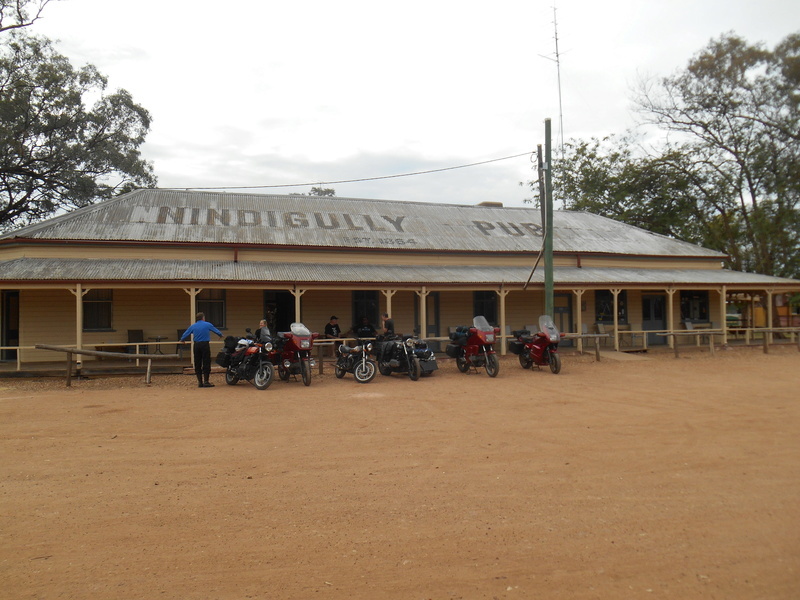 There is the pub at Nindigully where you can either book a room or throw a tent up across near the billabong. Hideously expensive pub food is available and is of decent quality. The idea would be to leave Guyra and head to Nindi on the Friday, staying overnight there, then on the Saturday head through to Ashford via Goondawindi etc and camp the night there. At Ashford it would be tents or swags at the camping area by the river out of town a click or so. Supplies can be bought at the servo there. 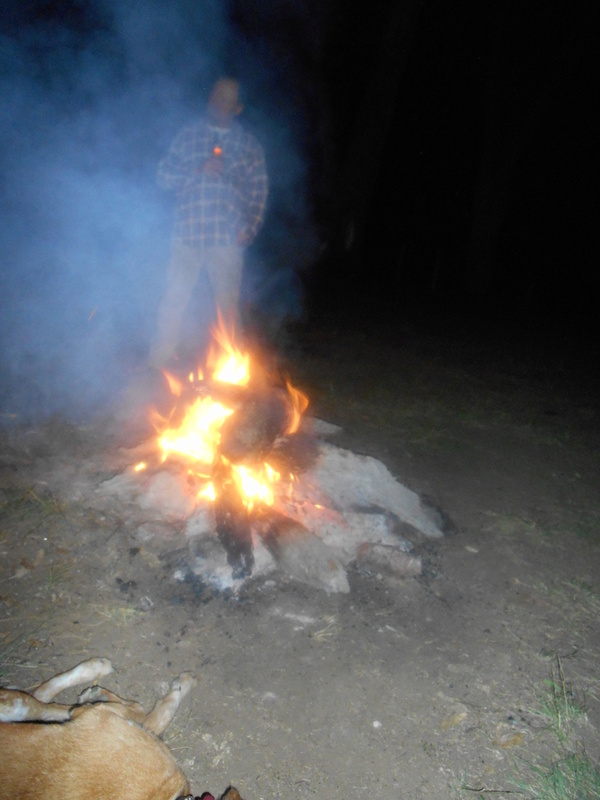 Get a fire going and enjoy a quiet evening by the river. From there a return to Guyra via some roads to Inverell and across. Anyone wishing to come along a day or so beforehand is welcome to stay over at our place either on the way to Nindi or on the way home or both. Obviously this is all more or less tentative and adjustments can be made in regards to which weekend etc. I don't think any of those dates clash with any major rides, ( though I might be wrong there)May is a good time of year to head in that direction as the weather will have cooled off but not be too cold for camping. I doubt I'll have the K project finished by then so I'll more than likely be taking the Cessna for this year's trip. Anyone interested let me know and we can work from there. Count me in, as you say it's a good time of year for a ride west. Sounds good Seanni. Count me in as I missed out last time around. Good idea Seanni. I'm in, providing I can get holidays. Will try and pack a fishing rod for Ashford. Fishing rod. Good idea Waz. I'll do the same. Yellow Belly or Cod I guess? 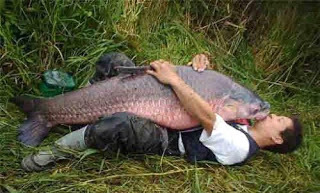 European Carp or a cold that's about it. Mathew in Brisbane would be good to say hello. Hey Seanii, saw a mention of the Ruptured Budgie Rally on up near Tenterfield on 19/20 May. Might be worth giving consideration to combining the rally and the Nindigully Run. Here's a link about the rally. I like the idea of going to that but I'll have to chat with my brother about it first and see what he's up to. He's talking of riding to Nindi from Leeton to say hello, so I'm not sure of his plans after that. Were you thinking of going directly to the RBR or NIndi first? To me it doesn't matter which way round. The RBR is only 90k for me. I'm with Rick G - doesn't matter which way round if I were to go. I just saw the dates and thought I'd throw it up for discussion. As I'm lucky enough to be one of those past the age of employment I can be very flexible with my travels. At that time of year it could be very pleasant travelling up that way and may be the ideal opportunity for some of our fellow forum members in the southern part of the great state of Kweensland to make themselves known to those of us from further south who regularly participate in the travelling circus. Ok so a tentative plan would be to meet at Nindigully on Friday May 18th in the afternoon/evening. On Saturday 19th ride from there to the RBR via Goondawindi and Bogabilla or whatever looks like a good route. From there a return home on the Sunday. This plan would mean, however, no overnight stop at Ashford, which was one of the enjoyments of the last ride. This is open to discussion by whoever is thinking of going. I just had holidays approved so my master plan is leave Gong Thursday heading through Bathurst over top of mountain then onto lightening ridge or close for over night. Friday Ninja gully, Saturday Ruptured budgy, Sunday head to Ashford then back home. My master plans often change but I like this one. I like your thoughts Waz. Might join you around Bathurst for the long inland loop. Geez May - I dont know what I'm doing tomorrow, let alone May. I'll be trying to attend, on something with 2 wheels. Just saw Gaz' post on another thread and realised we are still tentative about this Ninjagully ride. As no-one has suggested otherwise or indicated they'd like to come but not on those dates, I'll put in the weekend of May 18th-20th as the definite dates. I am not sure whether I'll go to the RBR from Nindi or go to Ashford yet... will play it by ear. I kind of like that spot at Well's Crossing. 'nen schönen Abend noch wünsche ich euch alle. Good thing Sean! As mentioned above I will plan to join Waz at Bathurst and loop around to Nindigully, then work the rest out from there. I agree that was a good camp spot that we took in last time. I would be inclined to just go to the spot at Ashford as Nindigully is either mud or dust. I agree Rick, best part of the Ninja gully ride was the Stop at Asford. What QLD riders are looking at going ? do you need help putting that drive and shaft on ? wouldn't take more than an hour mate ??? really .. I've arranged to meet my brother Tim at Nindi so that's where I'll be on the Friday night. He's riding over from Leeton and has recently had both shoulders done so I'm reluctant to change plans as far as that goes... I suspect he'll need a bed and not a campsite. Then I'll head to Ashford on the Saturday. We are working on a plan to get us out of the Hunter on Thursday morning, influenced of course by the Rickmeister need to take a long cut, but it will be a western loop with an overnight stop on Thursday and into Nindigully for Friday night. The Ashford campout on the initial Nindigully trip is well remembered by those who were there and we are keen to reprise that and maybe introduce the area to some that could not go last time. Looking forward to the Saturday night there. BTW if Smithy plans to burn the sausages in my pan again he will have to do the washing up himself. 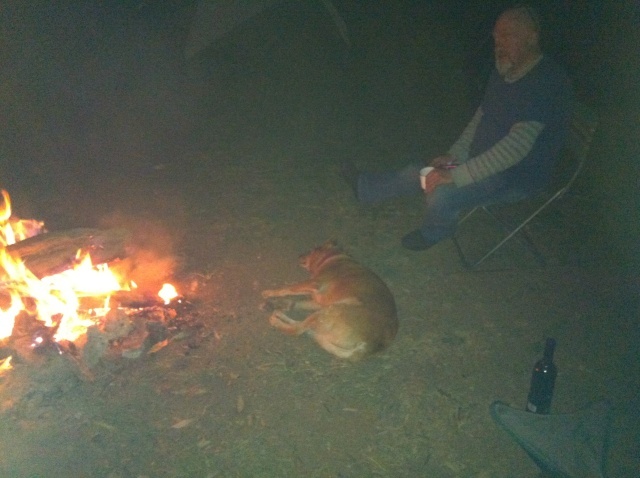 Sean, I hope you have been keeping Bella in training for her guard dog duties so that she is up to the same standard as the last Ashford camp out. @Waz wrote: I agree Rick, best part of the Ninja gully ride was the Stop at Asford. Yes it was a great night at Wells Crossing Ashford, looking forward to another one. Yes Wells Crossing is a good spot. Used to go fishing there when I was a kid. We always got more fish from the other side of the river from the camping area for some reason. Mainly catties though, which I dont mind. Not sure if she'll do the trip this year or not. She's starting to get on a bit now and I don't always take her on longer trips. See how she's going at the time! Seamus will certainly come along though. Good to see you're coming along Charlie! I'll supply the Jägermeister. I'm taking a small fishing rod this year. If you take a bigger fishing rod you'll get bigger fish. That sounds dangerous Tom. We'd better do it then! And a couple of drinking songs "Zehn kleine Jägermeister " and "Eisgekühlter Bommerlunder" to go along with those? I've been known to sing the odd song in German given the right amount of er ...imbibement encouragement. Lucky for you, you'll be of swanning about Europe. My fellow Knuts - time to propose a route for the 2018 Nindigully Long Cut. Current thoughts are for the Hunter Krew to hit the road about 7:00am on Thursday 17th May from the Branxton northbound rest area. As you would expect the route does not initially head in the direction of our destination but instead down via Bylong to Bathurst for lunch and meet with other Krew members from Sydney or south who may be coming. The attached link to the map shows a plan to get us to Gilgandra for Thursday night pub stopover. Friday by indirect route to Lightning Ridge for lunch and onward to our destination at Nindigully. Hopefully having survived the night at Nindigully we'll head via Goondiwindi and Texas to Wells Crossing near Ashford for our campover on Saturday night. Hopefully the plan will allow for any other Krew to work out where they may join us enroute should they so desire. Rough distance on the map to Inverell from Branxton is 1,700km. Elderly infirm in-law duty covering that weekend, otherwise I'd be joining you. Best wishes to the Krew for the ride and the socialising. That looks a mighty fine K bike wandering, indeed. Gahd, wish I could join ye merry gents. I have registered for 2 days off , successfully meaning I got 4 days without the threat of work ...yippee !!! I'm hatching a vague plan to ride over to Gilgandra on the Thursday and tag along from there. Not set in stone just yet though. Has anyone on the forum had any experiences in the hotels in Gilgandra? I've been through there a number of times but never had cause to stay over. I might make some inquiries in another week or so. Anyone with thoughts like Sean of catching up with the travelling circus there on the Thursday night - stick your hand up (and put up a post ). I've never stayed overnight in Gilgandra. If I show up I'll probably have a dog or two with me so I'll try the caravan park which appears to be pet friendly. I have often stayed in Gilli but at one of the cheap motels on the Dubbo road, problem with them is no where to get a feed. OK Krew members - I'll ring around tomorrow for pub accommodation in Gilgandra on Thursday night next week, 17th May. So far we have Waz, Tom, Stuart and myself taking the long cut via Bathurst with Smithy and Sean likely to be arriving in Gilgandra via a more direct route. If anyone else wants to be included in the pub accommodation number please put up a post or send me a PM. I'll check here before I ring through. if you can let me know which pub you'll be staying at, I'll make some enquiries about whether they'll let Seamus and I throw up a tent in the backyard. If not, at least I'll know where to find you for dinner and a tonsorial varnish. Thursday night accommodation has been booked at the Railway Hotel in Gilgandra. They only have single and double rooms but all rooms for us as a group are same price at $45. Have booked 6 rooms as they said they are very puppy friendly. Pub is away from the main street, dinner available in house and breakfast available if we request it. Bikes can go out the back. I'll give them a call just to make sure about Seamus, ( Bella will stay home to look after Kerry), and then work from there.